The VW T-Roc is up to #6 in Austria, its highest ranking anywhere in the world so far. New car sales in Austria are up by a robust 8.4% year-on-year in January to 28.568 registrations. Brand leader Volkswagen trails the market at +2% to 18.2% but both Skoda (+21%) and Seat (+32%) frankly outpace in on the podium. Mercedes (+22%) and BMW (+11%) are the only two other Top 10 carmakers to post double-digit gains whereas Hyundai freefalls 17% to #10 vs. #3 in December. Further down, there are a lot of manufacturers posting spectacular gains. Among them Subaru (+114%), Ssangyong (+75%), Mitsubishi (+70%), Toyota (+52%), Jaguar (+49%), Suzuki (+47%), Mazda (+43%), Mini (+40%), Alfa Romeo (+39%), Volvo (+33%), Jeep (+29%) and Porsche (+25%). 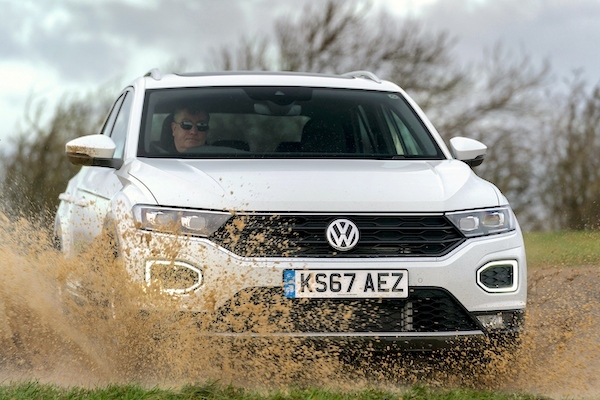 In the models ranking, Volkswagen monopolises the podium with the Golf (-17%), Polo (+37%) and Tiguan (-29%), with the VAG Group placing an incredible 8 models in the Top 8 and 9 nameplates in the Top 10: the Skoda Octavia (#4), Fabia (#5), the VW T-Roc shooting up 53 spots on December to a world-record 6th place, the Seat Leon (#7), Alhambra (#8) and finally Ibiza (#10). The only non-VAG nameplate in the Top 10 is the Renault Clio (#9). Notice also the Opel Crossland X up 23 ranks on last month to #15, the BMW X3 up 283% to #19, the Renault Scenic up 150% to #20, the Seat Arona up 83 spots on December to #22 and the Skoda Karoq up 48 to #23. Full January 2018 Top 45 All-brands and Top 302 All-models below.